Manda Moore- (Studio Director & Instructor) Ms. Manda is the owner and director of Manda's Rhythm & Dance, LLC. Her attention to detail, nurturing demeanor, and gift for creativity are the driving force behind the tremendous growth of her studio. In over ten years of operation, Ms. Manda has seen many successes including sold out studio performances, the development of a superior performance company, and an award winning competition team. Ms. Manda received her dance training in area dance studios and started to teach at the age of 16. She knew immediately that teaching dance was her passion and that she was determined to open a studio of her own. Ms. Manda attended Central Michigan University and received a degree in Entrepreneurship with a minor in Dance. She opened Manda's Rhythm & Dance in 2005 and in the Summer of 2007, was contracted to direct the dance program for Macomb Township Parks and Recreation. She continues her dance training with National conventions and seminars. She is the proud mother to 2 dancing daughters, Caroline and Camille. Maria Buchholtz- (Company Director & Recreational Instructor) Ms. Maria is a graduate of Wayne State University where she studied dance education and earned a BA in Liberal Arts. She has worked as a professional choreographer and instructor for over 20 years. Ms. Maria has continued to educate herself in teacher workshops and learning the most current and innovative teaching methods in the industry today. Maria is trained in classical ballet, contemporary, modern and jazz. She is also trained in ballroom dance. She loves teaching the adult ballroom classes her at MRD! She has learned the value of education through dance. Her favorite place is still in the classroom sharing her passion for the art of dance! She also loves spending time with her 2 daughters, a very patient husband and one crazy dog. Julie Geggie- Ms. Julie has been dancing since a young child with a focus on Ballet. Ms. Julie danced with Ms. Manda as a child at Metropolitan Ballet Center. She taught for many years in Birmingham at the Community House with Renee Wood and is a welcome addition to Manda's Rhythm & Dance, starting her second season. She is mom to 3 children, Brianna, Kyle and Violet. Ashley Haynes- (Recreation & Company Instructor) Miss Ashley has been dancing since she was 4 at local dance studios, and started teaching when she was 18. She coached Lutheran High North's Dance Team. In 2015, she graduated from Wayne State University with her Bachelors of Science in Dance. When she is not teaching dance, she is performing as an aerialist in the Metro Detroit area. Emily Hill- (Recreation & Company Instructor) Miss Emily has been dancing and performing since the age of two. She has danced and competed through various dance organizations throughout the Metro Detroit area. She attended Arts Academy in the Woods high school in Fraser. Miss Emily is currently in her fourth year as an honors student at Wayne State University working towards her B.S. degree in Dance and Dance Education, and a member of the National Dance Education Organization. She has performed in pieces choreographed by Jarrel Gordy, Lisa LaMarre, and Biba Bell in WSU biannual dance concerts. 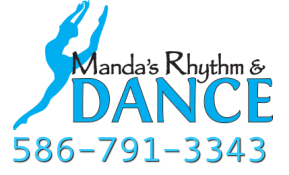 Miss Emily has been teaching dance for the last three years at Manda’s Rhythm and Dance and is beginning her fourth-year teaching. She has also recently finished her first year on ConTexture dance Detroit dance company. Emily has also recently been certified as a kickbox/fitness trainer through 9Round Eastpointe. Emily is very passionate about dance and movement and is excited for another great dance season! Molly Magnotte- (Recreation Instructor) Ms. Molly has coached competitive, recreational & preschool gymnastics for 10+ years. She enjoys watching kids learn and grow. She loves teaching Acro and uses the Acrobatic Arts curriculum in her classroom. She is also a stay at home mom to 4 young children. Gracie Reiter- (Recreation & Company Instructor) Ms. Gracie has been dancing since a very young age at local dance studios and has participated at various competitions. Ms. Gracie started as an assistant teacher at our studio and is entering her tenth year as an instructor for MRD and the Macomb Township Parks and Rec. She teaches Twinkle Babies, Twinkle Stars, Jazz, Ballet, Hip-Hop, Poms, and Tap.